Come & visit us in the pearl of Africa! when traveling to Uganda, the city of Entebbe is most probably your gate to this wonderful country. Right at the heart of the city, ViaVia is unmistakably the coziest option to start your long-awaited trip. We also offer a wide collection of tissues for tears of goodbye when heading back home. 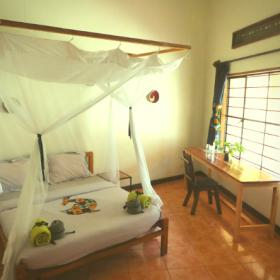 ViaVia sure is an affordable and cosy alternative for your overnight stay. Add our top-notch hammocks, dazzling garden and delicious healthy food to the mix, and you have a truly heartwarming experience that’s very hard to beat. Our notorious campfires make the ideal meeting place for people from across the globe. And while we have an excellent internet connection at the bar, reception and restaurant, our large population of birds doesn’t need any 4G to twitter twit all day long. ViaVia is a home away from home, but then slightly better! We even have romantic sunsets on request. Head to our Facebook page to stay tuned for the latest ViaVia news! 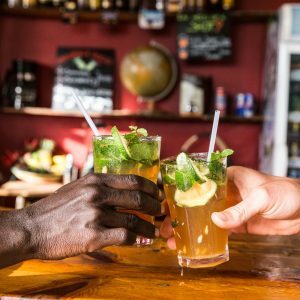 From freshly made smoothies and local beers to some good old Ugandan coffee: our beloved bar has it all. On today’s menu you will always find fresh and healthy food, spiced with world flavors. Start the day with our signature hearty breakfast, have lunch and get surprised by our international and Ugandan cuisine. If you’re lucky, you can share dessert with the resident monkeys playing in the trees while you’re relaxing on our outside terrace or in one of our hammocks. 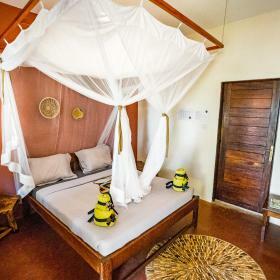 With 16 rooms overlooking the garden, all self-contained with lodge-style mosquito nets and a private terrace, we offer outstanding quality starting from 40 USD. 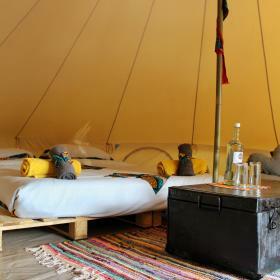 We also have two stunning tents that are fully-equipped and have everything guests need for a glamping experience. Our pristine laundry service and luggage storage solutions make for an even smoother holiday experience and thanks to our great internet connection, your dear followers won’t have to miss a single tweet. Traveling on a tight budget? 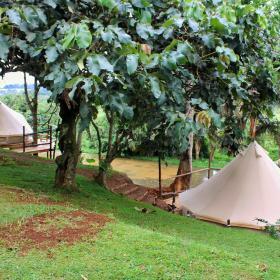 Try the dormitory or pick a spot in our spacious green garden under a mango or jackfruit tree to set up your tent or to park your overland car! Prices from 10 to 20 USD (breakfast included). 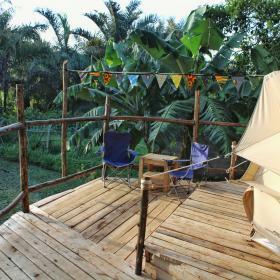 Uganda is a safe and wonderful touristic destination, endless to discover. Get overwhelmed by the stunning nature and wildlife, the cultural diversity within its boundaries and the typical warm hospitality. 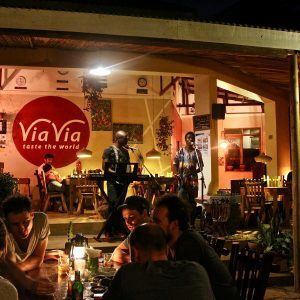 Viavia Entebbe can help you organize your trip! Entebbe is a positive respite from the Kampala chaos and it has lots of things to discover itself. You can visit Entebbe by bodaboda, bicycle or even on foot. Visit our travel corner on the spot or contact us for advice, tailor made tours or trips off the beaten track! If you need a rental car, we recommend Roadtrip Uganda. Your hosts Pieter, Lobke and Steven try to find the right Belgian and Ugandan ingredients to shake the cocktail until it bustles, inspires and invites. Pieter & Lobke lived in Rwanda for 3 years. 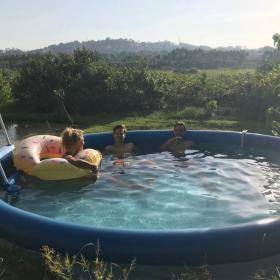 In Kigali, Pieter founded his own travel company, while Lobke was working for the Belgian Development Agency and later for a Belgian NGO. Steven is related Ugandan family to Pieter and Lobke. He studied in Malaysia and is a medical student in Kampala. We would like to share the beauty of Uganda with you. 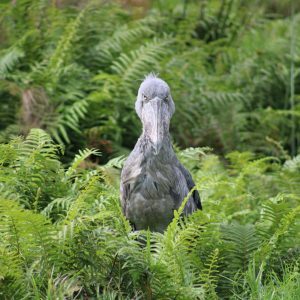 We will operate as passionate guides to let you discover the most interesting places in the surroundings of Entebbe, Uganda and Rwanda. We like to focus on sustainable tourism to create adventure and a positive impact on the community, the environment and the economy, stimulating cultural exchange and responsible traveling. Camping own tent: 10 USD p.p. 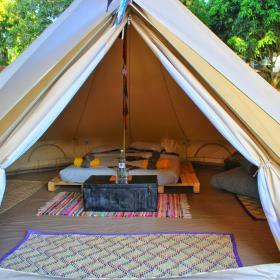 dormitory & 2 glamping tents. Follow the main road from the airport and take a left turn squeezed in between the Total fuel station and the Shell fuel station (so you leave the main road heading to Kampala here). Follow to the right (600m), you will see the first sign post on your left side at Mayor’s Pub corner. You leave the tarmac road, ViaVia Entebbe is just 2 minutes (800m) ahead. Follow the main road heading to the airport and take the road squeezed in between the Total fuel station and the Shell fuel station (so you leave the main road heading to Kampala here, right before you reach Victoria Mall). 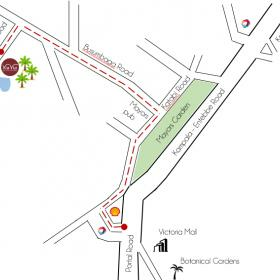 Follow to the right (600m), you will see a sign post on your left side at Mayor’s Pub corner. You leave the tarmac road, ViaVia Entebbe is just 2 minutes (800m) ahead. Be careful if you come from abroad: Uganda is an old British colony, so keep left!